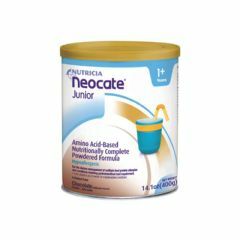 A nutritionally complete, powdered amino acid-based medical food for children over the age of 1 with severe impairment of the gastrointestinal tract. It contains extra vitamins and minerals for malabsorptive conditions and carbohydrate content formulated to minimize osmotic load. Intake to be determined by a healthcare professional and is dependent on the age, body weight and medical condition of the patient. Use under medical supervision. 100% non-allergenic free amino acids. Tailored vitamins and minerals for malabsorptive conditions. Cow and soy milk allergy. Carbohydrate content formulated to minimize osmotic load. Store unopened can at room temperature.